Last week, I reviewed the Ancina bag from Armadio Fashion. Today, I wanted to quickly show you another bag from the brand - the Maia. This bag was a surprise gift from the founder. Even though I didn't pick this one out, I ended up liking it a lot more than I thought I would. It's definitely not something I would have purchased on my own since I tend to lean towards classic styles. This little bag surprisingly can hold a ton of stuff. I don't carry a lot with me on a daily basis. This bag fits my regular iPhone 6, a lipstick, my card case, my car key and there is a lot more room to spare. 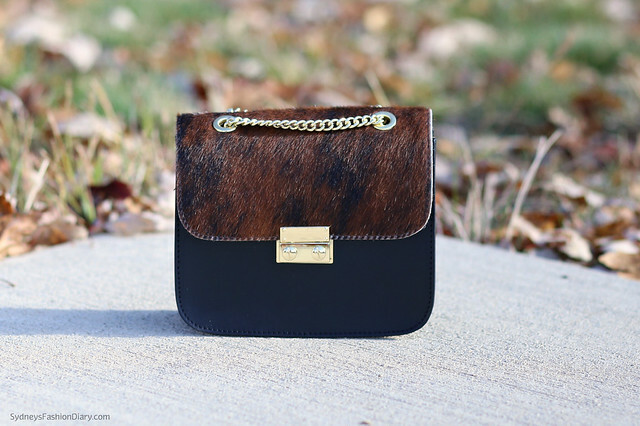 The two tones on the bag makes it more special and a touch of leopard is perfect for Fall. This bag and my red jumpsuit was a match made in fashion heaven =). This particular combination is a limited edition and no longer on the site but the orange and the black version are still available here. especially when I am out sight-seeing.